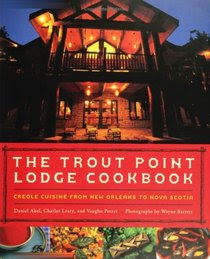 The guys behind Trout Point Lodge are an interesting lot. Daniel Abel, Charles Leary, and Vaughn Perret came together to become food entrepreneurs. . Two boys from Louisiana and one from Oregon who had studied law, worked in politics, and studied Chinese history; guys who had lived in China, New York City and Ithaca. The suits fell in love with farmer’s markets and were called back to the Crescent City. Soon they were raising chicken and goat, planting a garden and foraging both literally and figuratively for traditional Creole and Cajun ingredients. Soon restaurants in New Orleans were featuring their produce and cheeses. And then they took a trip to Nova Scotia. Nova Scotia was no accident. The original Cajun came to Louisiana from the Arcadian region of Nova Scotia. The French settlers who founded Nova Scotia were expelled and made their way to Louisiana. Arcadians who became “Cajuns” possessed an innate ability to live off the land and a remarkable respect for that land.Trout Point Lodge became their new venture. They built a cultural center, cooking school, and resort. The Pacific Northwest offers up a bounty of natural ingredients. In the Trout Point garden they grow fava beans.Here is a soup that can also double as a dip. 1. Bring a large pot of salted water to a boil, add the fava beans, and cook for 30 seconds. Drain and rinse under cold water. 2. Place the beans in a food processor and process into a paste. 3. Transfer the paste to a large mixing bowl, and stir in the lemon juice and olive oil until smooth. Add the cumin, tomatoes, parsley, mint, and cream. Stir well. Cove and chill in the refrigerator for at least 1 hour, or as long as 24 hours. 4. Serve cold, with a dollop of Crème Frâiche on top of each serving. Add a bit less cream and you have a great dip. Versatile and tasty.